Brooklane Village is located to the northeast of campus, and houses a mix of single students and students with families. Brooklane Village apartments are located approximately 15 walking minutes from the campus core. The “cluster” arrangement provides a small community atmosphere that is appreciated by the residents. Apartments are available in duplex units or two-story units and some apartments have access for mobility impaired students. Wilson Creek, separated from the complex by a fence, skirts the edge of Brooklane Village. A multipurpose building provides the residents with centrally located, coin operated laundry facilities. Outdoor play areas for children, as well as basketball courts, are provided. A large garden area is available where tenants may plant and care for individual vegetable gardens. Apartments are unfurnished (range and refrigerator provided). Utilities, except telephone service, are provided by the University. Tenants maintain the yard areas and sidewalks adjacent to their apartments. 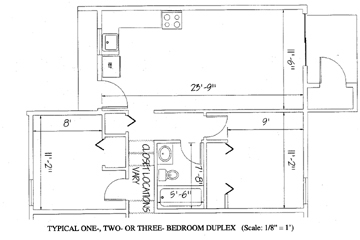 One bedroom — 520 sq. ft.
Two bedrooms — 630 sq. ft.
Three bedrooms — 740 sq. ft. If you have any questions concerning housing, please contact Housing and Residence Life at 509.963.1831 or by email at housing@cwu.edu. The grounds crew will be mowing the lawns every Friday so please keep the areas in front of your apartments clear. If you would like to check out of your apartment there are a few easy steps that you need to complete. 1. Contact housing to submit your 30 day notice. You can contact the Brooklane Managers by emailing Sui.Ioane@cwu.edu or Spencer.Manning@cwu.edu, or calling 509.963.7041. Email is the best way to get in contact with your manager. If you do email your manager please use a descriptive subject line. Staff has to go through the entire apartment no matter who is checking out . This means, staff checks: common spaces such as living room, kitchen, bathroom, and other shared spaces as well as bedrooms of the individual checking out. We do acknowledge that people are still living in an apartment if that is the case. This is the same for check ins as well. If you would like a cleaning list, please get in contact with your manager. Staff needs you to be present at your check out appointment. If you need to cancel or change the appointment in any way, please let your manager know ahead of time. If you are not present at your appointment, you will be charged $50 for an improper check out.